10 years! With this update, I have tracked my net worth every month (and shared it with you) for 10 years straight! So… what does 10 years of progress look like? Wait, what? How? How is it even possible that, without being able to work for the entire month (with the small exception of writing a grand total of two posts for this site! 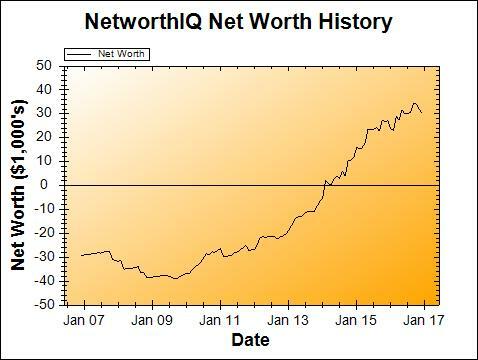 ), that my net worth went down by less than the cost of my medical bills alone? Obviously, the fact that my husband is still working is part of it, but his income pays the bills – we can’t build wealth on just one income (at least, not in Northern Virginia!). Plus, he took about a week’s worth of unpaid time off during the month of December, to help take care of the baby (and to catch up on sleep missed because of the baby…), so that really can’t account for it. The answer is: my money has started to work for me. Ten years of careful planning, debt payoff, saving, and investing, and now my money has a mind of its own. It can grow on its own. If you have followed my net worth updates for a while, you may have noticed that more and more, I mention that “the market” is responsible for the bigger swings (or for counteracting a swing that I made on my own). 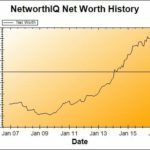 As time goes on, I have more money invested in the market, and that money becomes a bigger portion of my net worth, and then it becomes the main driver of net worth changes. And now, we’re starting to really see that come to fruition. The Good: cash, checking, savings, assets, etc. Credit card: $1731.54 with an interest rate around 17%. Painful. Student loans: $24,867.00, deferred payment for the time being, although the unsubsidized portion is wracking up interest as we type. While I don’t miss having only $166.79 in my checking accounts, no job, and no college degree… I can honestly say I miss my 1996 Oldsmobile. Leather interior – it was like a comfy couch on wheels! But it’s fun to look back and think how far I have come. I have an emergency fund, retirement accounts, a Bachelor of Science degree (B.S. – oh yeah! ), a job/freelance business, and I’ve even picked up a husband and a kid along the way! I hesitate to set any goals for 2017 yet, just because I really don’t know what my income will look like. I’m still on unpaid maternity leave right now, and I don’t know when I’ll be able to start working again, or how much work I’ll be able to do. Get net worth back above $34,293 as quickly as possible. That’s the new record high I hit back in May 2016. Given all the unknowns, I don’t like my chances for doing all of these things in 2017… but hey, I’ve surprised myself a lot over the last 10 years with what I can accomplish financially. Maybe, just maybe, I can do it again this year. 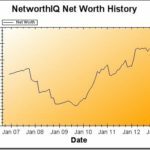 Wow, I’m seriously impressed you’ve been tracking your net worth for 10 years! I just passed the 3 year mark. Keep up the good work. I’m on a road trip from Toronto, and I’m anxious to pay off my credit cards to start the year off right.